Dr Raevski and Ahuja ... strategic partnership. 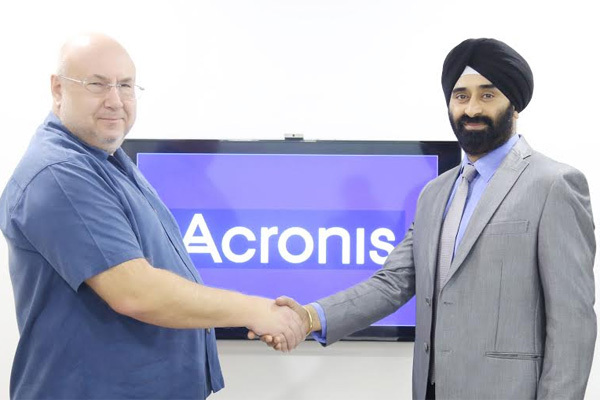 Acronis, a global leader in data protection, has finalised a new partner agreement with Al Hosani Computer, a software re-publisher and distributor, to distribute Acronis consumer products for the Middle East & African (MEA) region. Under the terms of the agreement, Al Hosani will republish and distribute the Acronis True Image 2015 family of products — the full system image backup solution, offering both on-premise and to the cloud (online) backups for personal use. A recent survey that Acronis conducted shows that consumers today regard their personal data as more valuable than the devices that store their data. The research points out that over 75 per cent of consumers store their data digitally and more than 50 per cent state that their personal data are more valuable than their actual devices – solidifying the notion that consumers know that they need to preserve their data. In fact, the survey results show that consumers would be nearly three times more upset if they lost their photos than if they lost their phone, computer or tablet. However, the survey also reveals that consumers put little effort into ensuring the safety of their data. Less than half of the respondents do not save their data on an external device or into the cloud. This means that more than 50 per cent of consumers store their data only on their computer, or in worst cases, none at all. Of those using a data backup system, only one third are protecting their entire computer system while the rest are simply protecting some files. “Our recent study that we commissioned reflects the growing importance of backup and being digitally responsible--especially in an environment where every part of consumers’ lives is now taking a digital form, including financial and health documents, photos, work files, and more,” said Guurprit Ahuja, director - Middle East & Africa, Acronis. Acronis True Image 2015 release is the first and only solution that protects the entire system, and offers full system image backup and both protection locally and to the cloud for multi-platform environments — including email, music, photos, videos, documents, settings, browser favourites, applications and operating system.